You may already know that many serious diseases such as diabetes and hypertension can do serious damage to the body long before you're aware of the problem unless you get regular checkups to look for such lurking threats. The same holds true for your eyesight, with many eye diseases and disorders causing progressive, permanent damage before you would ever notice a loss of visual acuity. Even refractive errors such as nearsightedness and farsightedness can sneak up on you gradually. That's why you'll do your eyes a big favor by scheduling a regular Clarksville eye exam with our optometry team at Sites Vision Clinic. Depending on your age, current state of ocular health and risk factors for any particular eye diseases, our Clarksville optometrist (Dr. Brian Murray or Dr. Paula Murray) may recommend an eye health, eye function and vision exam either every year or every other year. Your eye exam in Clarksville can detect a wide range of problems, some of which might need to be treated immediately to prevent continuing permanent eye damage and vision loss. Eye function testing - Eye function testing evaluates focusing ability, eye teaming and coordination, the physical alignment and position of the eyes, and the possible dominance of one eye over the other (a condition called "lazy eye" or amblyopia). Many of these conditions can be treated through vision therapy, corrective lenses and other methods. Eye function testing is especially important for children whose vision is still developing. 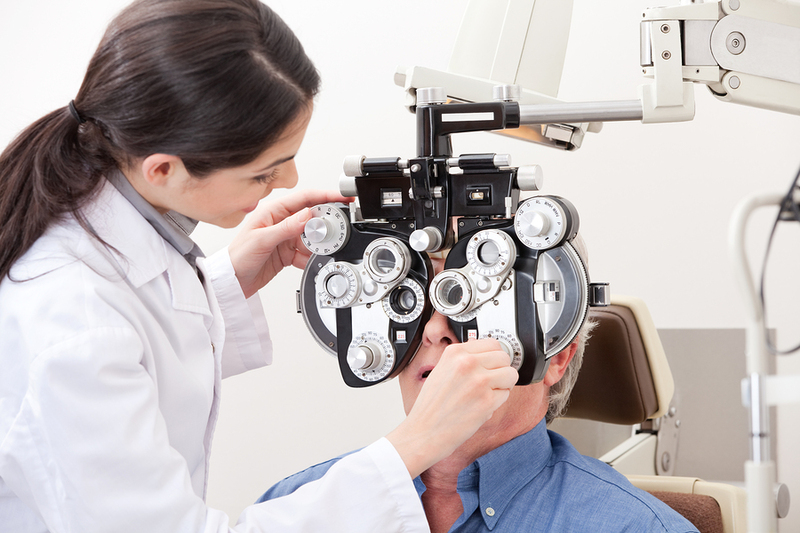 Eye health evaluation - Our Clarksville optometrist will dilate your pupils so to get a good look at a large portion of your inner eye, including the retina and optic nerve. This enables us to diagnose macular degeneration, diabetic retinopathy and other issues that require prompt care. We also examine the front of the eye for signs of infections, corneal problems and cataracts. A technique called tonometry checks your intraocular pressure for possible glaucoma. Vision exam - A regular vision exam helps us evaluate how sharp your vision is when viewing letters or symbols of different sizes on an eye chart, with the different sizes representing different distances. Blurry images at specific distances may indicate a refractive error (myopia, hyperopia, astigmatism or presbyopia). To obtain your corrective vision prescription, our Elkton optometrist will ask you to read the chart again through the eyepieces of a device called a phoropter. We try multiple lens combinations in the phoropter until we identify your ideal prescription for glasses or contact lenses. Our Clarksville Optometrist Is Waiting to Hear From You! One eye exam in Clarksville isn't enough to confirm your ongoing ocular well-being so call Sites Vision Clinic today at (931) 647-5237. Our Clarksville optometrist are ready to help you protect your vision for life, one exam at a time!